A company blog can help you grow and market your business. It can also help establish your company as an expert in your industry. Starting a company blog sounds great in theory, but when put into practice, you can experience many obstacles. These obstacles stop many businesses dead in their content marketing tracks. To succeed, you need a sound content strategy and the right inspiration to follow through with it. In this guide, we’ll walk you through the right way to start a company blog, show you excellent examples of them using content marketing the right way, and provide extra tips to make your words stand out against the competition. Blogs are the primary engine when it comes to content marketing for most businesses. Why do some companies fail with their blogging efforts? What purpose do you want content marketing to serve? Without the right answer to this question, you won’t build a solid strategy. Without a solid strategy, you’ll get frustrated and wonder why your plans aren’t working. If your plan isn’t working, you’ll give up on the process altogether because…you won’t have a clear reason why you shouldn’t give up. A guiding philosophy and purpose makes research, goal setting, and follow through much easier. There are many solid reasons behind any content marketing campaign. These are just a few of many potential reasons to start a blog. It’s important to choose one. After you’ve spent some time finding your ‘why,’ you can dive in and do deeper research. Here’s a dumb question…do you know your audience? Knowing your audience is key to creating a content marketing strategy that works. All too often, though, many business owners rely on intuition and never research the way their customers interact with content online. Customer research and keyword research can help you find the problems your customers are having. Great content solves problems. If you can identify their pain points, you can create compelling content they love. Let’s break down each type of research. Customer research involves finding out where your readers hang out online and what they’re saying about your industry, product, or service. There are many different places you can find useful information. Quora is a question and answer website. You can enter your topic into the search box and you’ll see question and answers on a variety of sub-topics. This is a result of the topic search ‘content marketing.’ This question can (and will be) an idea for a post you can write to answer questions from members of your target audience. You can read reviews of products related to your industry on Amazon to find out what your customers want and need. You can also use their reviews to discover pain points your competitors aren’t addressing. This review tells us some customers want the information without selling too hard, which is an achievable — even an ideal — goal. If you plan on using your company blog to drive traffic and gain leads, you need to harness the power of SEO. Keyword research is the bedrock of any SEO campaign. Once you have a sizable amount of keywords, you can move to step two. The goal of every business blog is the same right? Every company wants their blog to generate business. Even though traffic, leads, and sales are the end goal for most businesses, there are multiple ways to get there, and setting the right qualitative and quantitative goals will help your business blog stay on track when it’s time to create the content. Qualitative goals are goals you can’t measure with numbers. It’s important to have these types of goals because they guide the way you create your content. At MLT Group one of our goals is to give away our entire recipe for helping business owners succeed with digital marketing. This means we create informative and detailed content you could use on your own. If you decide to work with us to put the strategies into practice, even better. You can take the guiding philosophy — the ‘why’ — and use them to create goals. The goal here? Put some thought into the personality of your business blog. Good content marketing strategies always use numbers and data. A conversion occurs when a visitor performs a desired action like joining your email list, calling, or filling out a contact form. You want to set a conversion goal because they’re the end result you’re looking for. You need some measure of engagement. How do you choose a conversion goal? You can use industry standards to start and measure your progress over time. Most research says the average conversion rate is two to five percent. Choose a number that works for you. Once you decide your conversion rate, you can decide the number of engagements you want per month. Enter your ideal number, e.g., 100 calls per month, and set your ideal traffic number based on that. Conversion dictates traffic, not the other way around. You don’t want to chase vanity metrics, so starting with your conversions makes your traffic goals simple. If you want 100 calls per month and figure a two percent conversion rate, you’d need to reach 5,000 visitors per month. You can create goals that ramp up from the beginning of your business blog journey to the end. Once you have your conversion and traffic goals set, choose the frequency for your writing schedule. Best practices change for the website and blog. Th newer it is the more you’ll have to write to reach your goals. Most experts suggest publishing three to five posts per week. In your case, use a number that works for you and is sustainable. There’s no point setting a goal you or someone within your company can’t reach. The newer your website, the more time it will take to gain traction with your company blog. This is because newer websites have a lower Domain and Page authority, which are two important metrics used to rank websites on Google. Content marketing is a compounding effort. The more you post on your company blog, build links, and promote your content, the easier it will be to rank for competitive keywords and topics because your site will be more authoritative. Examples provide unique insights you can use for our own business. Here are some of the company blogs we love along with explanations for why their strategies are so effective. Sumo is an email marketing software. The tool helps you drive new leads with the use of pop-ups, link-trigger upgrades, and more. A company like this could just write about the features of its products, but Sumo chose to turn their company blog into a business school. Each blog post is a tactical guide that gives you step by step instructions to use a technique that helps you grow your bottom line. Naturally, the strategies often involve using their product, but they write the content in a way that’s so useful and makes so much sense that mentioning their product doesn’t seem pushy at all. Sumo practices what it preaches, which isn’t something all marketing companies can say. They also feature posts from the top experts in different niches of marketing like e-commerce and copywriting to publish some of the best marketing information on the web, period. Jason Fried and David Heinemeier Hansson, the founders of the project management software Basecamp, started the Signal v. Noise Medium blog to share their, often counterintuitive, thoughts on business culture, tech, design, and more. You could categorize Signal v. Noise as a thought leadership blog, but I doubt they’d find that appropriate. In fact, they reject most of the buzzwords and hyperbole that come with the industry and just tell it like it is. And they’re never afraid to have an unpopular or controversial opinion. Their authenticity helps them stand out and draws people to use their product. Hence the name Signal v. Noise. Noise is the useless, albeit attractive, information in the world. Signal is the truth that drives real change. While most people get ‘shiny object syndrome’ and chase noise — tactics and trends — the team at Basecamp tries to do what works based on principles they’ve gained over time and through experience. Due is a payment processing company. 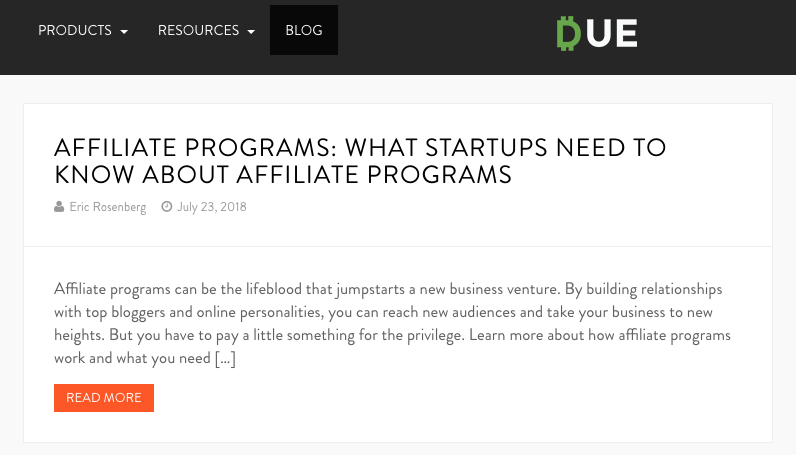 Similar to our Sumo example, Due often publishes posts on topics different types of entrepreneurs — all of which need payment processing — might want to know about. They also cover a wide range of topics about the financial industry. This all-encompassing blog, which never promotes their product outright, brings in revenue and leads with this educational approach. Now you know how to create a content strategy for your company blog. You’ve seen examples of popular business blogs. To end this post, we’ll leave you with our best tips for building a blog that stands out and getting it in front of the right people. Don’t be afraid to tell the truth about your industry. Use humor. Company blogs don’t have to be dry and boring. Use tools like Buffer to share your content regularly. Curate content from other business blogs in the industry and share it on social media. Join communities and forums on places like LinkedIn and Facebook – participate first, share your stuff later. Whatever posting frequency you choose, stick to it. Send a polite email to people you mention/link to in your posts letting them know how their content helped you. Think long term. Content marketing takes time. Find your unique selling proposition. Answer the question – what makes your business different? Write about topics that aren’t directly related to your industry, like this snack company did when creating a viral post about employee wellness. Republish your posts on platforms like Medium, LinkedIn, and Thrive Global. Repurpose your content in different formats like Slideshare, Instagram posts, and video. Feature author bios for the writer(s) to give your posts a personal touch. If applicable, use guest contributors to outsource some of your writing and publishing. Have fun and create content you want to create, but readers also love. 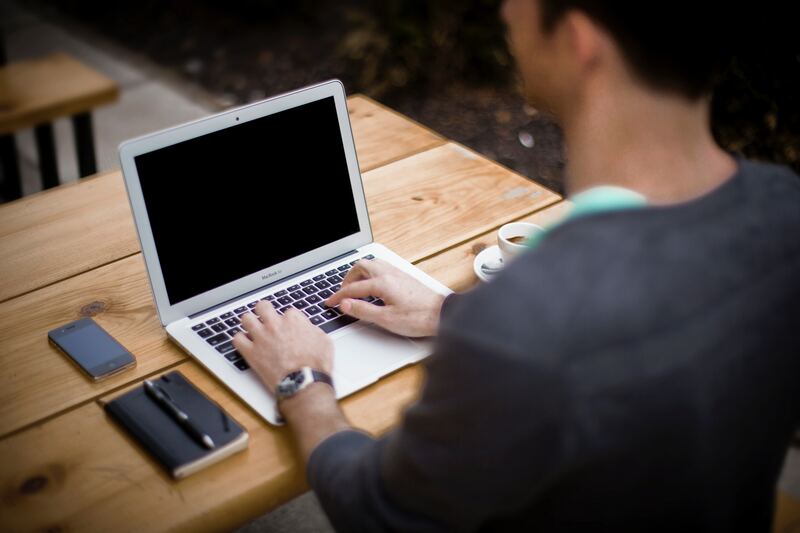 Company blogs can be a major part of your marketing strategy. Like all good strategies, tools, and techniques, you get what you put into them. If you’re dedicated, persistent, and willing to iterate, you can become a thought leader, grow your traffic, or achieve any other business related goal. Does your company have a blog? What strategies are you using to promote it?